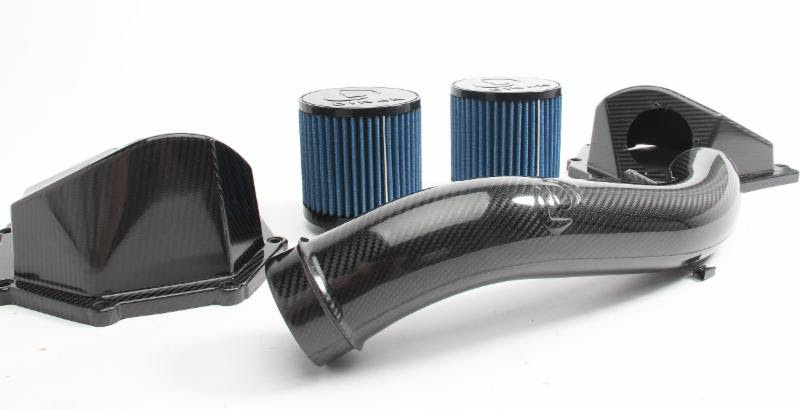 Keeping with the recent Dinan intake tradition the carbon fiber cold air intake for the F87 M2C is beyond reproach. The intake makes the under hood appearance of the newest M’s a work of art that could be the focal point of any car show or enthusiasts collection. While beauty is definitely a concern; efficiency and maximizing the potential of the stock intake design were the keys to development for the S55 intake. Their sealed system delivers as much cold outside air as possible to the engine by way of less resistance and a straighter freer flowing design which comes with an optimized carbon fiber tube. The increased amount of air feeds into dual larger volume air boxes complete with larger cylindrical filters that elicit a slightly more audible and sporty tone over its stock counterpart. This optimized design yields consistent 5-7 HP/TRQ gains throughout the power band even in stock configuration although when coupled with engine tuning the gains will be more significant.